The annual Top 50 Glazier issue is coming soon from Glass Magazine and to make the 27th annual list as best as it can be, please take a few minutes to do the survey—if you are a glazing company of course. Click here for survey. I love that issue—it’s always great to see the who’s who on that list! The Dodge Momentum Index went down again in its latest report. That index has been pretty volatile of late, but I think the one takeaway here for sure is that things are a bit murky in the construction world. I am staying positive, but I would like to see this index find some consistent trends. I am enthralled with the whole college entrance scandal that broke this week and ended up in the arrests of high-powered business people and entertainers. It really is amazing that when you have the sort of money and power that these people have you would go to illegal lengths to get your kids in to college. In many cases the kids did not want to go to college, but the parents wanted them to go. It’s an incredible story that I have feeling still has a few more chapters to it. Off topic, one movie to see and one to get excited to see. First up “Free Solo” the Oscar Award winning documentary about a guy who free climbed “El Cap” was incredible. The last 20 minutes will have you on the edge of your seat. Insane. The other is coming in the next month or two and is called “Yesterday.” It’s a creative look at a world without the “Beatles”—check my video of the week for a preview! Speaking of videos—go to this link and see a glass door in “action.” Thank you to my good friend Jon Johnson for sharing. The glass “worked” the hinges and install? Not so much! Thirsty Thursday alert: on March 21, the legend Bill Lingnell and the great Urmilla Sowell will have a presentation on edge grinding of laminated glass. I was honored to work on a session with this topic at the 2018 GlassBuild with Bill. It’s a deep, interesting and important topic if you are dealing with laminated glass. Register here. Last this week: we as an industry and the world itself lost another great person recently with the passing of Ruben Huerta of Glasswerks. Ruben was a part of the management and ownership at Glasswerks and was absolutely loved. Great guy and a huge loss. My thoughts and condolences go out to Ruben’s friends and family and the entire team at Glasswerks. I know Ruben will be sorely missed. It's time to submit your survey for the Top 50 Glaziers program, the longest-running glass industry ranking of top glazing contractors. 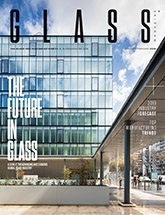 The June 2019 issue of Glass Magazine will feature the highest-earning contract glaziers of 2018. While the 27th annual report will feature leading North American glazing firms, ranked based on annual gross sales, it will also showcase standout glaziers who might not otherwise make the minimum cutoff. We want to feature the glass industry's achievements. In order for us to provide the most accurate and up-to-date information, we rely on direct submissions from the industry. If your company should be included in the Top 50 Glaziers report, please complete the survey. The submission deadline is March 29, 2019. BEC 2019 was like a blur to me. One moment it’s starting, and the next I’m in a crazy cab line at 3:30 a.m. headed back to the airport. Thankfully, I took notes along the way to share with everyone. My overall feel was the event was a huge success at every level. Networking is always top notch and it did not disappoint this year. More on that below. The educational content was off-the-charts incredible. We had a lot of new voices and personalities onstage, and they brought a great energy to the event. There was so much detailed info that it was almost too much (if that’s possible!). The planning committee has its work cut out for 2020. One person I hope is back at the next BEC is Cynthia Paul of FMI— her forecast and sharp presentation was a major highlight for me. On a personal note, I was very fortunate to host a panel that featured some serious brilliance. Paul Robinson of Pioneer Cladding & Glazing Systems, Brian Filipiak of Alliance Glazing and Neil Opfer from the University of Nevada, Las Vegas, were fabulous. Getting to work with industry guys like Paul and Brian was a thrill for me: they are superstars. The tabletop area was really interesting—so many neat products. The main ones that stood out were the handrail glass and insulating glass with glass spacer from sedak. The other one was the new safety clothing from Bohle America. I saw this material at glasstec and fell in love, and now it has advanced from what was on the floor in Germany. 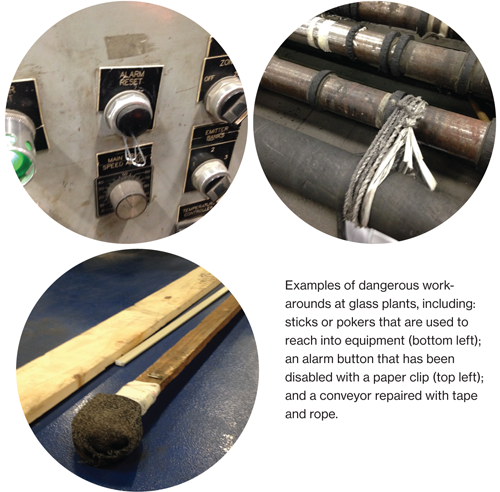 It’s a game changer for safety. Now, onto the networking and the folks I got to visit with. I’ll say it up front, it is an honor to share an industry with these folks and all that attended. Class acts everywhere! The industry MVP from 2018, Nathalie Thibault of Prelco, was there, and getting a few minutes with her is awesome, as is reminiscing with her co-worker Greg DiVona. Greg remembers me when I was breaking in, and he treated me just as great then as he does now. I will always be grateful for that. It was great to see Darand Davies who just started a new company, Black Line Glazing, and was 150 pounds lighter—he looked tiptop! Meanwhile, seeing Keith Stockman of Glasswerks was very nice, a reminder of a great friend from past work history. Dan Pompeo, one of the best manufacturers’ reps around, was a bit down in the dumps; after all it’s been, like, 28 days since one of his Boston teams won a world title. Poor guy, LOL. I always love visiting with Mike Gainey of Ensinger. Mike’s knowledge base never fails to impress me, and I always learn something when we visit. The same goes for Dr. Helen Sanders, as it doesn’t matter what she’s focused on, I am learning. It was very cool to meet Josh Wignall of EFCO Corp. for the first time in person. He is a force online, with a great marketing mind, so to meet him face to face was an honor. Same with Steven Brooks of SmartLift USA. His energy level is infectious! And while it’s not the first time I met Tom Donovan of Suntuitive, it was his first BEC and it looked like he was doing well with tons of people interested in his growing product. A blast from the past was Brad Austin of Harmon. This event and its success can be sourced back to the support that Brad gave it in the early years when he was at Viracon. And, of course, speaking of that great company, once again my admiration for Garret Henson, Cameron Scripture and Seth Madole could not be any higher. Such good people and I appreciate them giving me just a few seconds of their time. Same with Jim Stathopoulos of Ajay Glass who is always welcoming and classy. This was the 2nd BEC after NGA and GANA’s combination, and I thought about the commitments that people like Stanley Yee of Dow Corning made to make this industry better. Stanley is always 10 steps ahead of the rest of us. So is Julie Schimmelpenningh of Eastman. We were on same flight out and got to catch up at the airport, because once we get to the conference, Julie gets mobbed by people and I never see her again. Same scenario with Chris Dolan of Guardian Glass—airport catch up and then we don’t see each other again. Their popularity is awesome. It wouldn’t be a BEC without celebrating a birthday for Jerry Moser of R.A. Kennedy & Sons. Jerry is an absolute legend. Love the guy. And if I didn’t include Max Halls and Ian Patlin in that same category, I’d be doing a massive disservice to them. It would not be an industry event if I didn’t see the great Tom O’Malley from Clover Architectural and the amazing Shelly Farmer from Trex Commercial Products. Both of them do such a great job working the room and event; they get it. I should put Chuck Knickerbocker of TGP in that same group too! I was bummed that Jon Kimberlain of Dow could not make it to the event. Jon is another one who had such a major role in BEC’s past; it was noticeable not to have him there. Hopefully he followed along on social media. Last this week, a quick story. Twice during the event I was confused for Max Halls. Both folks who confused me for Max had a bit too much to drink, but I have to say I was pretty pumped to be confused for a very skinny, tanned guy with great hair. I guess I should hang around with folks who are drinking more often? Anyway, this event is done, and now my focus show-wise will be on GlassBuild America in September. Get ready, folks, we have an event like no other coming in a few months, and we are going to pack the A-T-L with thousands of glass industry professionals who all want to advance their businesses and careers. Delegated design is the process where the design professional of record, the architect or engineer (AOR or EOR), defers detailed design and engineering responsibilities for certain building elements or systems, usually to a constructor or subcontractor, and their “delegated design” professional, typically a professional engineer. The delegated design process includes for example, things like pre-fabricated stairs, steel connections, tilt-up precast panels, railings, and our favorite in the context of this blog, the curtain wall and exterior cladding systems. Building permitting is provided by the authority having jurisdiction, contingent upon the delegated entities providing PE sealed documents, shop drawings, calculation reports, etc., prior to occupancy and completion of construction. These are usually called “deferred submittals.” Let’s confine this discussion to curtain wall systems as a category. Custom and monumental curtain wall systems are getting increasingly complex. Simultaneously, standard curtain wall systems are getting increasingly well defined, or at least accessible. There’s a bit of a dichotomy in this. On the one hand, the presence of online resources provides access to standard system typologies in increasing clarity, even though the applications to the particular building are still very specific. At the same time, available technologies, computer and modeling tools, the increase in performance requirements, owner demand, and more, are making custom systems increasingly complex. Remember too, that compliance needs rarely decrease with code cycles and as building science evolves, so does the scope of documentation and the components being documented continue to get more rigorous. There’s a slight problem though; a trend that continues to reveal itself. It has been happening for quite some time. While delegated design requirements and responsibilities are increasing, in general, the quality of documentation in contract documents—architectural drawings and specifications—is decreasing. This is not to say all projects are in this category, but it’s generally what we see more often than not. More work is being required to be done by the delegated design professional and their team to get dimensions, details, missing information, to secure answers to RFI’s, coordinate around conflicts, and to drive the curtain wall design and engineering to conclusion. Submittal reviews also tend to take more time than in the past, and often lack clarity in the response and commentary. The conclusion of this process is expressed in a set or sets of shop drawings and engineering calculations, with other support documents, from which the system can be fabricated and installed. When architects, subcontractors, delegated design professionals, and other stakeholders work together, this process can be quite fruitful and productive. When they do not, it’s a challenging process. We all need to do a better job, together, of defining the project plan, what each entity is accountable for, and to stick to it. The work always seems to get done, but sometimes there’s too much collateral damage left behind. I believe the industry, those of us working together, are mature enough to lead in this regard and to drive to improved results. Who’s with me? It’s finally BEC week and I, along with 600 others, will be learning the latest details in the contract glazing world, while networking all the way through. As I always do, next week I’ll have a complete recap with everything I learned and those folks I was lucky enough to bump into. Events like this are so crucial for our industry and our future. If you have missed this one, I’ll let it pass but we have Fall Conference coming and then the granddaddy of the them all—GlassBuild America in September. That is one you simply cannot afford to skip, especially this year. A lot more coming on that and the new exciting events scheduled at North America’s largest glass and glazing event! Congrats to my friend, the brilliant Rob Struble and the folks at Vitro on the launch of a new brand identity. The look is super; love the color and the texture aspect to the logo. The tag line is different and creative. All in all, a great job by everyone involved there. Also kudos to Tara Brummet of Vitrum on her recent promotion to business development manager. I have known Tara for several years and she’s a tremendous talent and person. I am very happy that she continues to move up the ladder; a great call by Thomas Martini and the team at Vitrum. Orlando was No.1 and given what I have seen when I have been there recently, makes sense. I was surprised to see Phoenix at No.2, I thought they were lagging, but I guess not. Austin and Houston were tied at No.3 and Dallas-Ft Worth at No.8, which means the great state of Texas is still indeed great. On the ones that were a lot lower than I thought: Nashville and Charlotte tied at No.21 and Washington, D.C. at No.34 were surprising. Whole breakdown and explanations are here. From all accounts the International Builders Show in Las Vegas was strong. Once again, the big door systems caught the eyeballs of the crowd. That has been a trend for a while now and hits on the same theme we have on the commercial side. Large spans that allow natural light are the key. Attitude on the floor from what I am told was positive about the economy and market as well. I’ll take that any day of the week. I saw an article on the potential upgrades to the Pittsburgh International Airport. The upgrades look great but my mind raced back to when this new airport opened in the early 90s. I was new to the business, but our family company fabricated a ton of the glass work there. (Remember my brother Steve can sell better than anyone—that’s how a fabricator our size did a job like that). Once the job was complete and the airport opened my brother and I went out to see it. This was obviously pre-9/11 and the Pittsburgh Airport was built like a mall, with a heavy retail presence unlike any airport before. You could come and go as you wanted with minimal security. We walked around the entire terminal bending over and looking at logos and markings on spacers. Celebrating when we saw “PDC” and getting bummed when we saw others. Anyway, the updated airport renderings made me think back to those truly different times, and my gosh if we did the searching for logos (on our hands and knees, standing on chairs etc.) and markings in today’s security climate we’d be sent to jail! Last this week, not glass related but interesting nonetheless: a contest to come up with new drinking cups. For me I didn’t realize what the make-up of the current “disposable” coffee and soda cups were and what they are potentially doing to the environment, so this contest seems fascinating. We’ll see what happens next.